This mini-challenge is all about picking your favorite quotes about 'love' and 'friendship'. I went with friendship quotes, because friendship are a powerful thing. I'm a big fan of Disney, so I went with a quote from Winnie the Pooh by A.A Milne. Sketched by me, based on a picture from A.A Milne's work. “You are my best friend as well as my lover, and I do not know which side of you I enjoy the most. I treasure each side, just as I have treasured our life together.” - Nicholas Sparks, The notebook. "You said it once before," said Hermione quickly, "that there was time to turn back if we wanted to. We've had time, haven't we? We're with you whatever happens.” - Hermione, J.K Rowling, Harry Potter & the half-blood prince. And the last one, because I think it's powerful to see this happen between two guys. “He looked at his friend, perhaps for the last time, and said what he had always known, from the moment they’d met, when he’d understood that the prince was his brother in soul. “I love you.” - Sarah J. Maas, Heir of fire. So much love for these quotes!!! *hearts* And that drawing is so adorable, Mel! Love these beautiful quotes, so much love and wonderfulness. Wonderful quotes and what a lovely sketch! Wow,the sketch is adorable!I also love your handwriting. I love these quotes so much!! (And I WISH the kids I nanny would be interested in reading Winnie the Pooh *grumble grumble* Cute sketch btw!) And I love, LOVE that Maas not only has powerful ships, obviously, but you see really strong platonic relationships that are man/man, woman/man, and woman/woman and I LOVE that. I don't get to read many books where authors do that. Yes, I think that's what makes that series truly stand out. Great job on the cute little drawing! I really like the Nicholas Sparks quote. I completely agree that for people to be in love, there has to be a foundation of friendship. Cute sketch! :) It's one of my favourite quotes <3 Also love Hermione's of course! It's definitely one of my favorite quotes from entire series. I love what is stands for. A.A. Milne is such a winner when it comes to quotes! I love Winnie the Pooh--wonderful sketch, Mel! Ohh, that sounds like a cool place to visit! Oh gosh that HoF one... my SOUL. IT HURTS. Gahhhh. I am in desperate need of QoS! I also loved the others too! :D And that sketch is awesome! That Heir of Fire quote kills me every single time. LOVE these quotes! That is a wonderful sketch of Winnie the Pooh. I used a Pooh Bear quote as well. There are so many wonderful quotes from Winnie the Pooh! The Heir of Fire quote! My heart! I need Queen of Shadows now, I'm dying! These are such fantastic quotes! I'm such a massive fan of the HP and Heir of Fire quotes especially. I need Queen of Shadows now! Aww, I love that quote from Winnie the Pooh. It's so sweet. Ooh what an awesome sketch :) Great quote too! I really like the quotes you picked! 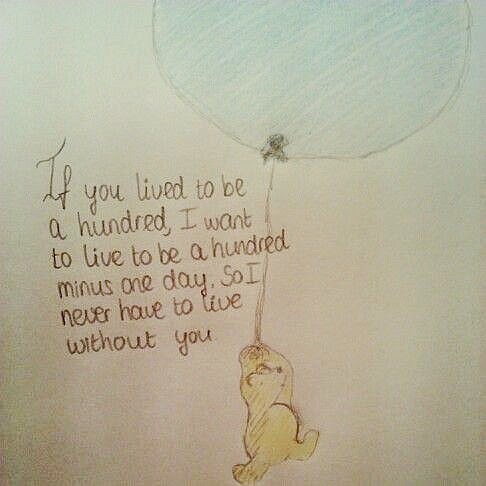 Plus, the Winnie the Pooh quote and sketch is sooo cute! When it comes to romance, I also tend tog ravitate towards the notebook. I love the passion those two share and I feel like they truly get love with all there's to it.